Located in the heart of the Crossroads District, CF18 is proud to be first in bringing elite fitness to Downtown Kansas City. 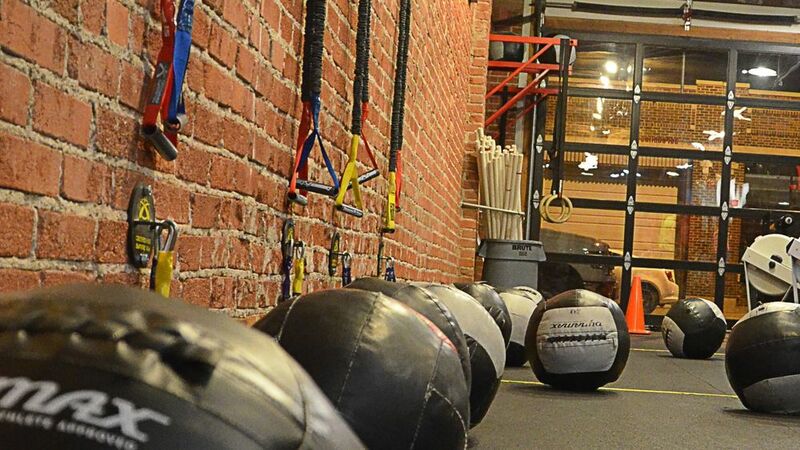 What's the difference between bootcamp and crossfit? Our Bootcamp is high intensity interval training that leverages basic movements using bodyweight as well as weighted equipment that will make for "cardio" unlike any you've experienced. CrossFit is defined as "constantly varied functional movements performed at relatively high intensity" — drawing from gymnastics, cardiovascular endurance sports and Olympic weightlifting — which is highly measurable and this measurability is a main factor in increased motivation, greater accountability, and building a community that compares, shares and celebrates success. 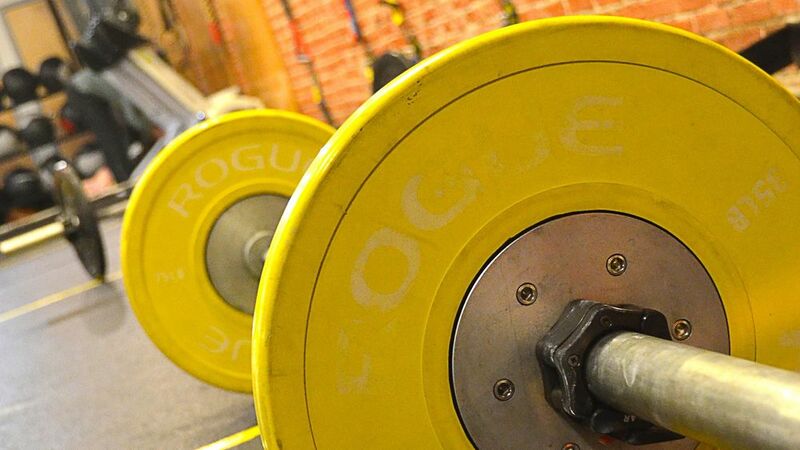 In every class, our athletes are taught proper technique, are expected to do the work, and get results. Your coach will know you by name and your progress is the reason he or she is here. Both formats are always changing, never boring, and always safe and tailored to the individual athlete. Absolutely not! Every single movement in every workout is scalable to the individual's fitness level and skill set, so whether you're already a serious athlete or just getting started on your way to being one, CrossFit is for you. Individual monthly membership (with auto-pay) costs $129 for unlimited workouts. There is no long-term commitment (we simply require a 30-day cancellation notice). Plus, you can try us out with no risk by getting your first 6 sessions for only $39, so what are you waiting for? Click here to to purchase this introductory offer online! I am a crossfitter visiting kansas city — can i drop in? We'd love to have you. You must pick a class to attend (our Open Gym times are for members only) and the drop-in fee is $25. Click here to pre-purchase a Single Class. Then give us a call or send us an email with some advance notice if you can. It's you against the workout — you get to decide exactly how intense it will be, but we are here to inspire you to make sure every class pushes you to the top of your current fitness level. Every session is coached in a class format in our 4500-square-foot facility (think of it as semi-private instruction) and results in no more monotony, no more unwanted pounds, better core strength, a tighter backside, functional strength and agility that apply to sports as well as the things you do every day. If you give it your all for 6 months, you'll certainly be in the very best shape of your life. After your workout, there are showers for use by our athletes (bring your own towel and toiletries). When the KC School District is closed for inclement weather, our early bird classes are cancelled. We do hold our other classes come rain, snow or shine but you can always check our Facebook page for any other cancellations due to bad weather. A one-time, 30-day Membership for an Individual is $159. Click here to purchase this full-price membership online. -Family Auto-Pay Membership (for parents and siblings residing at the same address) is $209/mo. Click here to go to our online reservations system, then click "Sign Up!" in the upper right corner and enter your first and last name in the "New to Our Site" fields. After you click "Next," you'll enter your contact and login information to create an account. Once your account is created, go to the "My Info" tab and enter and save your billing information. Send an email to john@crossroadsbootcamp.com with your name, phone number and chosen membership type and we'll get you set up! If you are completely new to fitness, or even if you're coming from a traditional gym routine, exercise classes, recreational sports or are just trying to get in shape after a long break, we STRONGLY encourage you to start with a CROSSFIT + 1 class on Monday, Tuesday or Thursday at 5:45 pm, or Saturday at 10:00 am where you will have the added benefit of an additional coach to help you safely assimilate into this type of training. We also have a workout called OLY FOUNDATIONS on Thursday at 6:45 pm that helps both new and seasoned CrossFitters improve their technique. By first attending one or two of these suggested workouts, you allow yourself (and us) a read on your current endurance and fitness levels relative to our way of training. In addition to that, it give us the perfect opportunity to teach you proper form and how to safely do all of the basic movements that make up the foundation on which CrossFit is built — getting a great and challenging first workout in the process. If you're visiting us for the first time — or especially if you are returning to CrossFit after a break — you are also welcome and encouraged to join us for our OLY FOUNDATIONS class. Backgrounds in this sport vary wildly and we want to make sure we're setting everyone up for success. If you're thoroughly convinced that you're ready to jump right in, we still recommend starting with one of our Monday, Tuesday or Thursday 5:45 pm or Saturday 10:00am CROSSFIT + 1 sessions to benefit from additional coaching where needed. Please arrive a little early or stay after for a few minutes to talk to our coaches; we are happy to address any questions about getting oriented to our training options and schedule. Keep in mind as you progress in CrossFit that OLY FOUNDATIONS on Thursday at 6:45 pm is a great way to refine your technique and reconnect to proper form on the foundational skills. All CF18 coaches are CrossFit trained, CPR certified and experienced in group training. JOHN BENZ | HEAD COACH | After more than two decades of service in Kansas City's fitness industry, I know you have to reinvent and evolve to succeed. That's precisely why this format is so challenging, so motivating and so worth the effort — you will literally reinvent your best body ever. I look forward to every single class I instruct and I take personal pride in YOUR results and I pledge maximum effort in keeping you focused and dedicated. BRIAN ENGLISH | COACH | When I played football in high school and college and then went on to study exercise science and play rugby, all the while I was striving to stay in the best physical shape possible in order to perform better as an athlete. I joined CF18 the month it opened and immediately fell in love with this place. After achieving my Level 1 Certification, I now love having the opportunity to help you be stronger than yesterday. JESS REINHARDT | COACH | When I was introduced to CrossFit, it was like nothing I had ever done before and I saw both physical and mental changes that I had never experienced in all my years in the competitive sports of swimming and soccer. I truly found my "home" after coming to CF18 because of the team spirit and welcoming atmosphere. And with my Level 1 Certification, I can help bring that community spirit home to you. LAUREN HOWELL | COACH | For 13 years, I was a competitive gymnast and haven't left the gym since, training competitive gymnasts to the Regional and National level. When I walked into CF18, I knew this was the next sport for me — the sport of fitness, and I quickly went on to receive my Level 1 CrossFit Certification. I am looking forward to helping you work toward all of your fitness goals. Can't wait to see you at the gym! KENT MASTERS | COACH | I've had a love for exercise since high school when I began lifting weights. At first, I loved conventional bodybuilding—but like many first flames it began to die out. It wasn't until I found CrossFit that my training began to be rewarding again on a day-to-day basis. I vow to do everything I can to create that same experience for our members here at CF18. DANA DAVENPORT | COACH | Because I was a "bring it on" type kid, my mother put me in every athletic activity she could. I was surrounded by good coaches and mentors who taught me my life's fundamentals at a very early age. Those lessons of teamwork, of everyone working toward a common goal and having empathy for the person next to you, they all influence the way I train my classes and how I live my life. It's my job to help you feel motivated, successful and strong. CARA COCKRILL | COACH | After having two babies in two years, I needed to mix it up to get back to my pre-baby body. As a group fitness and personal trainer and avid long-distance runner, I was used to asking my body to endure — but it wasn't until I flipped tractor tires and ran sprints while holding a medicine ball over my head that I got in better shape than I was before I had kids. I push my clients to get out of their comfort zones. Let's go! MIRIAM FEINGOLD | COACH | I've always been all about cross-training — as a skating and bench coach for KC's Roller Warriors Roller Derby League, as a dance trainer and performer and as a yoga practitioner and instructor. I got my Level 1 Certification because I believe CrossFit is unique in its ability to transform people's daily struggles in maintaining a healthy, vibrant and strong lifestyle. I'm more than ready to help you change your workout and change your life. BRETT PRUITT | COACH | CF18 turned my idea of health and fitness on its ear, because here everyone is an athlete with the potential to be great — the only difference between us all is in how hard we choose to train. I am thoroughly committed to helping all new and existing members become the athlete they strive to be, and more. This is not only a lifestyle, but a passion that I need to share and it's the reason I'm so happy to be a part of Crossroads Bootcamp and CF18. MICHAEL GINESTRA | COACH | When I finished playing college football I thought I was finished being an athlete. But when I found CF18 in 2012, CrossFit proved me wrong. With it came an entirely new perspective on fitness that has completely overhauled the way I set goals, train, eat and live. I want to bring this same life-changing experience to all of our members. "Dropped in for a WOD while in KC for a conference. Great workout and super nice!!!" "The Crossroads crew helped me transform from being obese back to fighting weight inside of 6 months. The entire coaching staff is an inspiration!" "Great gym! Challenging and strategic programming, coaches are great teachers and just an all-around great community. Highly recommend!" If you've taken advantage of our limited-time special offer via Groupon, follow these steps to activate your Groupon. Click here to be taken directly to our online reservations system, where the Groupon offer will be automatically dropped into a Shopping Cart for checkout. To connect your Shopping Cart to your new account, click "Check Out" in the lower right and enter your first and last name in the "New to Our Site" fields. After you click "Next," you'll enter your contact and login information and click "Create Account". Once your account is created, you'll need to click "Checkout" once more to finalize the activation of your Groupon purchase. On the next screen, click the "View Schedule" button to view options for your first class and choose the best option for your schedule. When you are prompted for payment, simply enter the promo code: GROUPON1 and it will take your class fee down to $0. We STRONGLY recommend that your first class is one of our CrossFit+1 Classes, offered Monday, Tuesday and Thursday evenings at 5:45pm and also on Saturday at 10:00am. These classes are staffed with an extra coach to assure that you get all the attention you need as a new client at CrossFit on 18th. We also have a Thursday evening 6:45pm workout called Oly Foundations that helps both new and seasoned CrossFitters establish and improve their technique. By first attending one or two of these suggested workouts, you allow yourself (and us) a read on your current endurance and fitness levels relative to our way of training. In addition to that, it gives us the perfect opportunity to teach you proper form and how to safely do all of the basic movements that make up the foundation on which CrossFit is built — getting a great and challenging first workout in the process. If you cannot make one of those classes to start, just let your coach know you are new and we promise to give you the attention you may need to feel welcome, safe and successful at our gym. Please arrive a few minutes early for class to complete and sign a waiver as well as provide proof of your Groupon purchase via printed voucher or display on your mobile device. Please note: you will not be allowed to participate in classes without your Groupon proof of purchase. GROUPON STEP FIVE — WHAT HAPPENS AFTER YOU USE ALL OF YOUR GROUPON SESSIONS? We feel certain that you'll see (and, more importantly, feel) a difference after only a few workouts and that you'll be convinced this is only the beginning of something great. Because we want to cheer you on to continued success, we are happy to deduct the purchase price of your Groupon from the cost of your first month's ongoing membership. Ask us for more details at the gym. Groupon offer available only to first time visitors to CF18 | CRBC or to lapsed members who have not attended classes for at least one year. Your Groupon begins the first day you workout with us and expires 45 days from that date. Additional questions? Email info@crossroadsbootcamp. Want to be up-to-the-minute informed about the latest goings-on at CF18 | CRBC? Check out our Facebook page! And if you follow us there, you'll never be left wondering what's going on at the gym. We regularly post the upcoming WOD the evening before on our Facebook page. And if you're a member who'd like to track your progress on Beyond the Whiteboard, send an email request to john@crossroadsbootcamp.com. Surprise a loved one with an experience at CF18 | CRBC that they will not soon forget. Our CF18 | CRBC Gift Certificates are a great option for the holidays, birthdays, anniversaries, or just because. Your purchase produces an uploaded personalized certificate ready for giving!